You know better than anyone how it feels to walk your halls and sit in your classrooms. You look out the window and can envision the positive outcomes that The SMP will provide to your staff and students. You’ve decided you want The School Mindfulness Project to lay the foundation for change that you want for your school community. Read through our FAQ’s and take a look at the timeline for program implementation. This information will provide you with a clear sense of how our program integrates into your school day and help you decide if our program is a good fit for your school. Complete and Submit The Application, and await our response. You can expect to hear from us within 2-4 weeks. WHEN AND WHERE ARE CLASSES AND TRAININGS HELD? All five phases of training take place on-site at your school in accordance with the provided timeline and chart. As you can see from, the first three phases are completed in 16 weeks, at which point your staff are prepared to integrate the teachings into the school day as needed. Phase 4 takes place in the way of oversight from our staff for an additional four weeks. The optional Phase 5 yoga classes, which continue indefinitely, can begin at the end of Phase 4 or as early as the end of Phase 3. Requires a space large enough for all school staff to gather on yoga mats, such as a cafeteria or gymnasium. This is a 6-week (7.5 hour) program for your staff. Classes are 75 minutes in length and can take place before or after school hours. This portion programming can qualify for professional development for your staff. This portion of programming is held in each individual classroom with students at their desks and your staff present and observing or participating. Classes are 60 minutes and take place over a 12-week time period. So if your school has thirty classrooms, we’ll be providing a total of 360 classes during this phase. This portion of training is 11.5-hours and takes place in 75-minute sessions over 9 weeks and is taught to your entire staff at one time in a desk and chair setting, ideally in a classroom learning environment that can accommodate your staff. Phase 3 can take place before school, after school, or during weekly Professional Development days. This part of the programming may also qualify as professional development hours for your staff. When: Weeks 7-15, before school, after school, or during weekly PD. 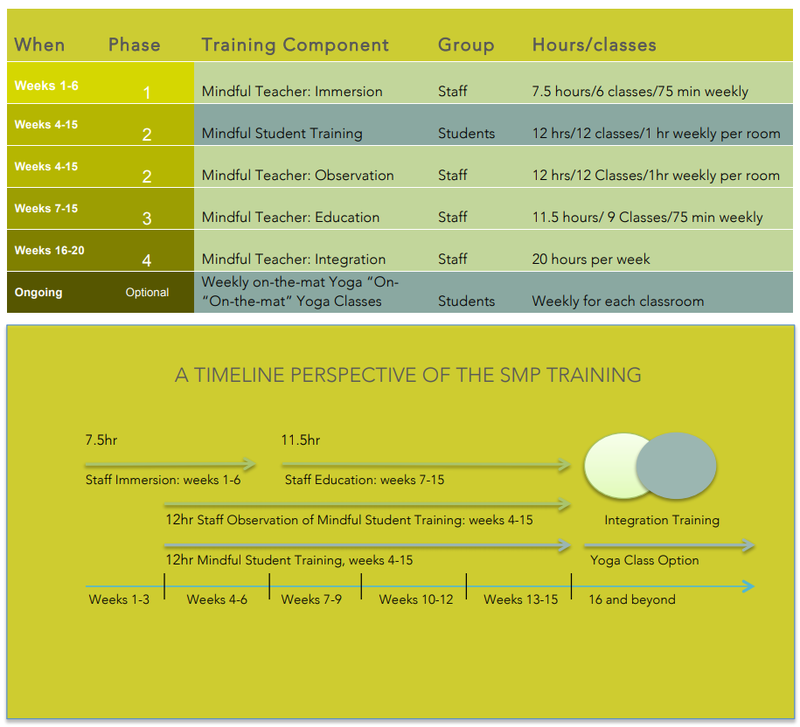 Here we provide oversight and support for your staff as they begin to teach The SMP mindfulness and mindful movement curriculum to their students. This takes place in the classroom as our staff observes and assist yours for 4 weeks post-training for an average of 30 hours per week. The programming is designed to follow your students through their academic life with your school. With this phase your school receives a full-time SMP yoga instructor, who in addition to being a registered children’s yoga teacher is an SMP trained educator. Classes will take place once per week for each class in your school in a designated “yoga classroom” or other space that will accommodate 25 students on yoga mats. HOW IS THE SMP PROGRAM FUNDED? As a 501c3 organization, The SMP aims to raise 97% of funding for its programming. We request that schools assume fundraising responsibility for 3% of the total program cost, or 14% of that which can be classified as professional development. The overall cost of implementation varies based upon school size and further fluctuates if we include a research component. Total program cost per school can vary from $250,000 to $350,000 for year one, depending upon the size of the school. For planning purposes, partnering schools can anticipate a requested effort to raise funds in the range of $7,000 -$11,000 or can utilize their professional development budget to cover this. IF MY SCHOOL IS UNABLE TO RAISE 3% OF THE FUNDS, WILL YOU STILL BE ABLE TO PROVIDE PROGRAMMING OR ACCEPT OUR APPLICATION? We will provide programming so long as we’ve been able to raise the necessary funding on our end to cover that 3%. We will accept an application and consider your school for partnering so long as you are committed to making a best effort, even if you are uncertain that you will be able to raise anything. DOES THE SMP RETURN AFTER THE FIRST YEAR? HOW IS THE PROGRAM FUNDED IN SUCCESSIVE YEARS? The SMP will work with your school to continue to raise funds for successive years of on-the-mat yoga classes and to return for additional training for incoming students and new staff as needed. We also can provide refresher trainings and additional integration oversight in successive years. As with the first year, The SMP will request that schools support 3% of the program cost for continued on-the-mat yoga classes and additional training. You can expect this to be between $1,500 and $4,000 per year depending upon the number of yoga teachers required to sustain weekly classes for your students. HOW CAN MY SCHOOL PARTNER WITH THE SMP? The first step to partner with the SMP is to make sure the appropriate staff members at your school are as committed to bringing The SMP to your school as you are. We’d like to know that your school counselor or psychologist, other teachers, school nurse, and school Principal are on board. Once the commitment is there, please have your school principal reach out to our Executive Director, Gail Silver, at gail@schoolmindfulness.org to let us know to keep an eye out for your School Partner Application. We are interested in hearing why you feel your school can benefit from our program and knowing that your school leadership team, as well as your staff, are committed to learning how mindfulness and mindful movement education can help change your school climate and the overall wellbeing of your school. You do not need to speak to the benefits of mindfulness and yoga, but please tell us what is happening at your school that makes you feel The SMP is needed. You might choose to share mental health, truancy, detention, school violence, academic, referral and other statistics specific to your school that will help provide a picture of the current climate in your school. A story (with names redacted) or a description of particular incidents, patterns of behavior or recurring issues is a helpful way for us to see your school as well. Please also include any relevant information or statistics regarding retention of staff and job satisfaction. If you become a partnering school, we may use this information to help raise funds for programming at your school. My school or its community partner organization is committed to fundraising to support 3% of the program costs. You should receive a reply from us confirming receipt of your email and can expect a response from our team within two to four weeks letting you know if we’re able to meet with you for the purposes of moving forward in partnership. We plan to support Philadelphia schools indefinitely as we build this sustainable programming, so if your school is not selected at this time, please feel welcome to reach out again.